After yesterday's big rally the markets opened flat today. At 10:00 after pending home sales were reported much lower than expected, the market started to rally for some reason. By 11:00 when the SPX and the Nasdaq made a new uptrend high they must have noticed that a lower than expected number is not that good for the economy... Hence, the markets tanked until 90 minutes before the close. Then, the markets bottomed and rallied into the close. The Dow closed slightly lower at 10572 (-0,11%), the SPX made a new uptrend high in the end of day rally at 1137 and closed there (+0,31%) and the Nasdaq closed flat (+0,01%) at 2309. It's quite difficult to make a proper short term count. 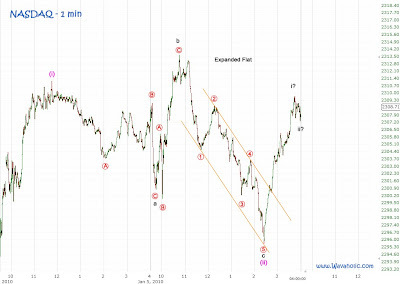 A possibility is that wave (i) and (ii) of wave [v] are completed and that wave (iii) began just before today's close.